Worthing Thunder guard James Grinham breathed a sigh of relief as his side sealed fourth-placed finish in the National League Division 1 standings. Zaire Taylor, who revealed post-game that he will be returning next season, exploded for 34 points with Grinham hitting six three-pointers in an 18-point haul as Thunder edged to a 103-95 victory over Manchester Magic in the final game of the regular season on Saturday. 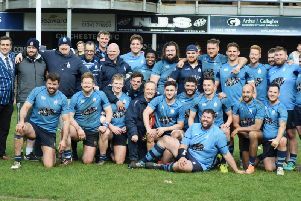 The win not only gives Worthing fourth spot but also hands them a home tie in the first round of the play-offs, where they will face Team Northumbria. Had Thunder lost against Manchester then they would have finished fifth, which would have meant rolls reversed as a trip to Newcastle would have awaited them in the play-off first round. Grinham said: “We knew that we were in for a tough night. Manchester like to run but we are happy for the win and we are in a good position ahead of our home game with Team Northumbria. Both teams have split the regular season matches, with Worthing owning the head-to-head as their 85-76 home win was greater than the 88-83 success Team Northumbria enjoyed at Sport Central in the reverse fixture. Thunder captain Brendan Okoronkwo, who won the supporters club player of the year award, believes that home advantage certainly plays in their favour on Saturday. Okoronkwo said: “We love playing in front of our fans as they give us great energy and it’s a bonus that we are perhaps the best-supported team in the league. “It’s great to play in front of 300-odd fans every home game and especially for the play-offs. Worthing will also be boosted with the news that starting guard Jorge Ebanks will return to the line-up in time for the Team Northumbria clash after missing the last three games with a groin problem.